The PV Range: Unique parquet, white-waxed oak tops and misty-grey painted acacia carcasses. 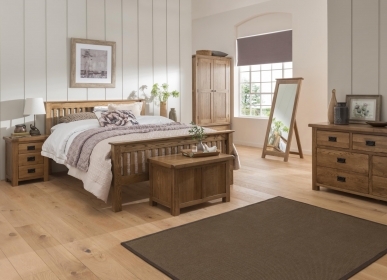 Highly Commended in the Furniture Awards 2018, the PV range is a beautiful, country range. The furniture has turned legs, bun feet, and parquet oak tops which are finished in a white wax to soften the natural grain of the wood. The sleigh bed is a unique piece, with its Louis Philippe styling and parquet head and foot ends. The acacia carcasses are painted in misty-grey and add a touch of feminine elegance to any room. Both bedroom and new, highly anticipated dining pieces are available in this range of furniture. The parquet oak tops are hand finished with white wax to soften the natural grain of the oak.